Opening hours 10am – 1pm from March to October. We stock a range of everyday things the busy gardener needs, all at very competitive prices! If we don’t have what you want when you call then please ask us to order it for you. Categories: allotment gardening | Tags: allotment shop, fruit growing, London Borough of Barnet, North Finchley Allotment Society, vegetable growing | Permalink. If you have not already done so please bring your tenancy transfer and agreement forms and payments to the Trading Hut as soon as possible. If you haven’t received your pack of papers, please pick one up from the shop which is now open 11:00 – 13:00 on Saturdays and Sundays. When we have completed the transfers, new locks will be fitted to the gates and you will be issued with a new key. 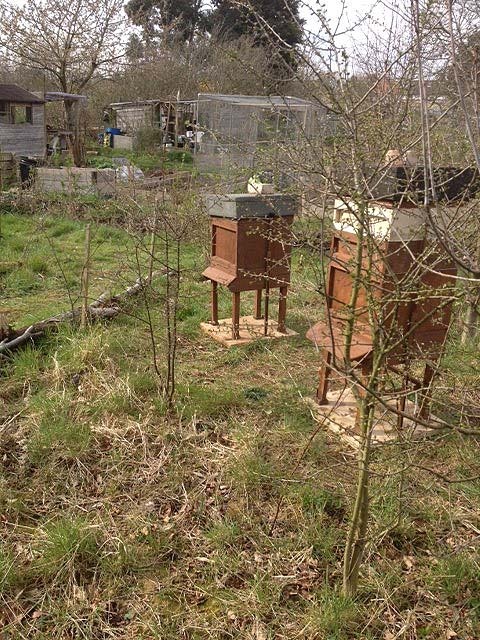 Barnet Federation’s official bee-keeper has recently installed two hives in the widlife area, and now that the weather has warmed up the bees seem to be enjoying their new home! Tenants who are qualified bee-keepers are welcome to keep bees at Glebelands. Categories: allotment gardening | Tags: Barnet Federation of Allotment and Horticultural Societies, Bee-keeping, London Borough of Barnet, NFAS, North Finchley Allotment Society | Permalink.